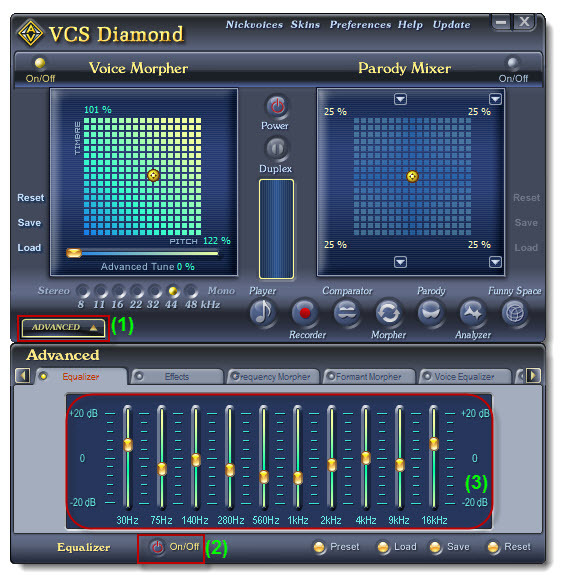 Voice Changer Software Diamond will give you a free ticket back to childhood by bringing back your childish voice. Then you can use the voice to tell your children the same old boring bedtime story in more exciting way or to help your kids practicing a role in school play or just simply color the way you chatting with your friends. - On the main panel, click on the On/Off (1) button to turn on Voice Morpher panel. 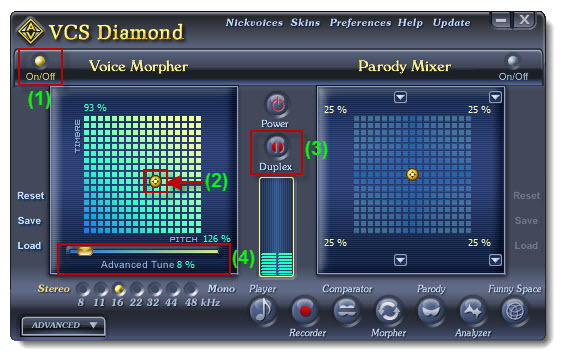 Remember that move the cursor up will make your voice younger; move it left for boy's voice and right for girl's voice. Because each voice is characterized on pitch and timbre, it is recommended that you should try more or less before decide which pitch and timbre parameter produces best childish voice. - For me, Pitch 126% and Timbre 93% is perfect for a kid's voice, so I leave the cursor there. It is recommended that you should turn on the Duplex button (3) to test how your voice sounds like. The Advanced Tune is a special control for adjusting voice timbre. Move the Advanced Tune slider (4) left (or right) to decrease (or increase) the value. - Expand the Advanced (1) panel and go to the Equalizer tab. - Make change to each slider at a time while speaking into the mircrophone to pre-listen to how your voice sounds like. Your changed voice is now ready to use in voice chatting via VoIP application such as Skype, Yahoo! Messenger or Google Hangouts. Or you can use this voice to create an homemade audio story for children. I believe it will your kids' favorite bedtime story. » For instant use, you can download the kid's voice preset here. Learn how to use the preset here. » For more ready-to-use nickvoices, please visit our Add-on library.